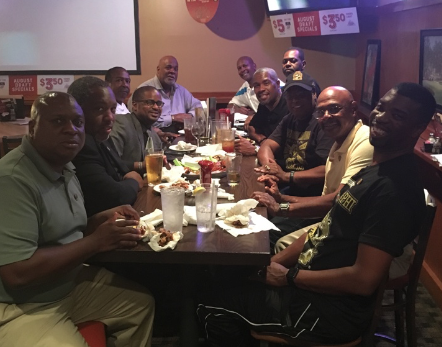 Greenville, South Carolina - About twenty local Brothers enjoyed a night of fellowship at a local eatry, Fox and Hound Grill Pub, on August 24, 2016 for the seventy-five chartnering anniversary of Gamma Gamma Lambda Chapter of Alpha Phi Alpha Fraternity, Inc. The gathering was a light night of brotherly fellowship and discussion which included a toast to the chapter's anniversary with Brother dropping in through the mixer. The event started at 7 PM and lasted until 10 PM. GGL Brothers toasting the 75 Anniversary of the Chapter's chartering. The Chapter also commissioned a lapel pin marking the milestone. 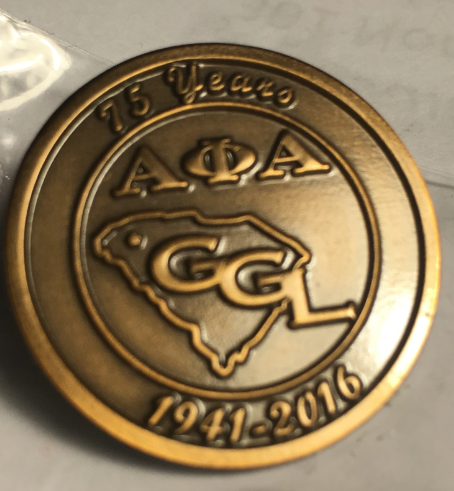 The pin is available to brothers with a suggested donation to the Alpha Phi Alpha Greenville Foundation (AGF). That foundation, established in 2012, supports many of the service efforts for the Chapter in the local community. The foundation's web page, www.alphagreenville.org, lists all of the evenst funded by the foundation. Brothers can purchase the Lapel pin by either contacting AGF Foundation Treasurer Jimmy Durante, attending a GGL Chapter meeting or using an eventbrite page, to pay online at https://ggl75pin.eventbrite.com. GGL 75th Year Anniversary Chatering Lapel pin. Gamma Gamma Lambda Chapter of Alpha Phi Alpha Fraternity, Inc. was chartered on August 24, 1941. The Chapter was chartered as third Alumni chapter in SC under the Fraternal administration of Bro. Ray W. Logan, 16th General President and Bro. Jos. H.B. Evans, General Secretary. For more than seventy years, and under the Umbrella of the National Organization, Gamma Gamma Lambda Chapter set as her objective to carry out the mandates of "Manly Deeds, Scholarship, and Love for All Mankind".